We eat potatoes, fried potatoes, french fries. This is a wrong type of fasting. You should not fast like that. A little bit of food and food which is easily digestible. A little bit of fruits and drink a lot water. When body is not so heavy or dull, then it blossoms and meditation happen better. 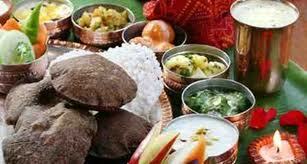 Fasting is an ancient method to detox prescribed by Ayurveda per body type (Vata, Pita, Kapha). For example, if you have Kapha dosha, to restrain from deep fried food, have green beans, carrots, and so on. In general khicchadhi is used in Ayurvedic detox diet. One needs to first know ones doshas. It's also necessary to have lots of fluid, 6 - 8 glasses, to wash away the eliminated toxins and reduce the taxing on the liver and kidney. Having no food increases acidity, it's not good, in fact one should have more alkaline fruits and vegetables. Fasting is to eat healthy, low carb diet, fresh fruits vegetables, protein, healthy food. which is essentially called a "Sattvic" diet in Ayurveda. It's not a to starve yourself to please a God. Ancient teachers linked it to God, like Tuesday for Hanuman, etc. so that people would fast. Starving yourself is not good. Now fasting has become ritualistic and dogmatic without people understanding the true meaning behind it. Also, a lot of people will eat unhealthy food as mentioned by Sri Sri. Nowadays you see a lot of detox diets. That's exactly what the ancient method of fasting was. If we can't practice the ancient methods correctly and they have become corrupted let's follow the new modern scientific method which is essentially "Punarnava" the old method renewed. It was said that we should fast on the elevanth day of the lunar month, "Ekadashi." Why? Because certain cronic ailments peek either on no moon night or full moon night. If we eat a detox diet three days prior to the no moon or full moon night, our ailments will be reduced because it takes three days for that to reach all the cells of the body. It is very scientific. Navratri, the nine days dedicated to divine creation, is a good time to do complete cleansing on all levels. On body level through yoga, fasting (detox). It is good to fast for at least 3 days because it takes that much time to be cleansed down to the cellular level. It's the same in Ayurveda's Panchakarma. The 2 Navratris in a year are good for bi-annual complete detox. On the breath level through Pranayama. On the mind level through turning the senses inwards, keeping the vow of silence for a few days, and keeping the senses in check. Keeping the intellect engaged in spiritual knowledge. Meditating. This gives the body deep rest and rejuvination. It's a good time to go to a spiritual retreat to for a few days or going through the Ayurvedic Panchakarma. If we do this during Navratri then we will be renewed by Dussera!